For those who gripe over lack of metro connectivity to Hitec City, here is a piece of good news. HYDERABAD: For those who gripe over lack of metro connectivity to Hitec City, here is a piece of good news. Metro Rail Safety (MRS) commissioner has given his nod for the commencement of metro services between Ameerpet and Hitec City covering a distance of 10 km. L&T Metro Rail (Hyderabad) Limited (LTMRHL) has been carrying out trial runs on this stretch since November last year. As Model Code was in force in view of Lok Sabha elections, the State government is learnt to have decided to approach the Election Commission of India for allowing them to start passenger operations. 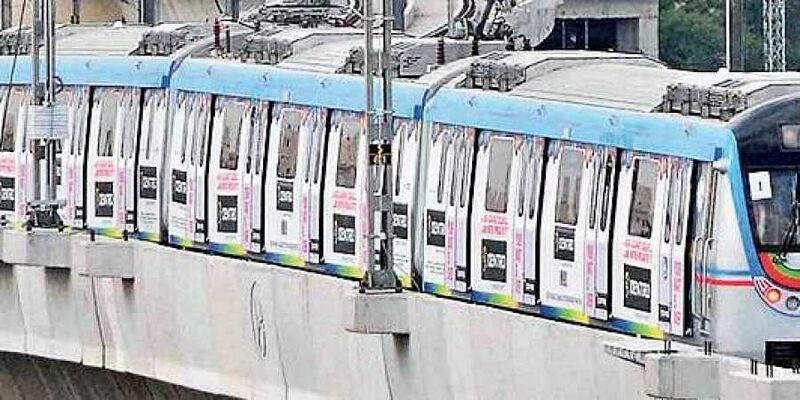 If LTMRHL gets green signal from the ECI, Hyderabad Metro Rail Ltd (HMRL) will approach the Chief Minister’s office for fixing the inaugural date. Or HMRL might commence operations without much fanfare. The Ameerpet- Hitec city Metro stretch has about eight stations - Madhura Nagar, Yousufguda, Road Number 5, Jubilee Hills, Jubilee Hills check post, Peddamma Temple, Madhapur, Durgam Cheruvu, Hitec City and Shilparamam. Currently, nearly 1.50 lakh passengers travel every day on the existing routes of Miyapur-LB Nagar and Nagole-Ameerpet. Once the services on the Ameerpet- Hitec City route commences, officials expect the patronage to increase steadily as connectivity to Hitec city is a long felt need of those who work in IT companies. According to officials, taking the Metro viaduct towards Raidurg in left direction adjacent to the existing Hitec city flyover was wedged between Cyber towers and Shilparamam and was a major engineering challenge. Adhering to Chief Minister K Chandrashekar Rao’s instructions that Shilparamam premises will have to be protected, HMRL asked LTMRHL to redesign the Metro viaduct on Cyber towers side instead of the originally proposed Shilparamam side and locate it between Cyber towers and the Hitec city flyover. Sources said that Chief Electrical Inspector for HMR, DVS Raju in November 2018 conducted inspection of Overhead Electric Traction System between Ameerpet and Hitec City. The traction system is fed from the 132kV/25kV Receiving Substation (RSS) of the HMRL at Yousufguda and Uppal. Incoming supply to this RSS is drawn from 220kV/132kV main substation of TS Transco. This facilitated complete connectivity from Nagole to Hitec City.